This entry was posted on Saturday, June 17th, 2006 at 11:20 pm and is filed under Uncategorized. You can follow any responses to this entry through the RSS 2.0 feed. You can leave a response, or trackback from your own site. 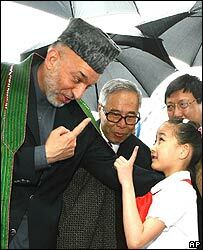 Can you doctor that photo so that Karzai is flicking off the little girl? I’ll help spread it around the ‘net w/ you. Cause an int’l uproar. At first glance, that is what I thought he was doing. lol ..the caption to go with the picture should be from the girls side “can’t i meet someone with real power? To be fair to Karzai, Washington came to power on the backs of french support so wats wrong with Karzai claiming the same title?